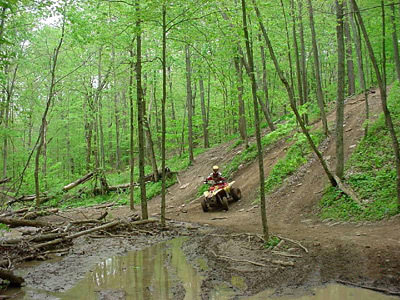 New Indiana law effective July 1, 2017: Everyone under age 18 MUST wear a helmet at all times while riding in or on ALL off road vehicles, whether on public or private property! Camping is available at Haspin Acres at no additional charge. 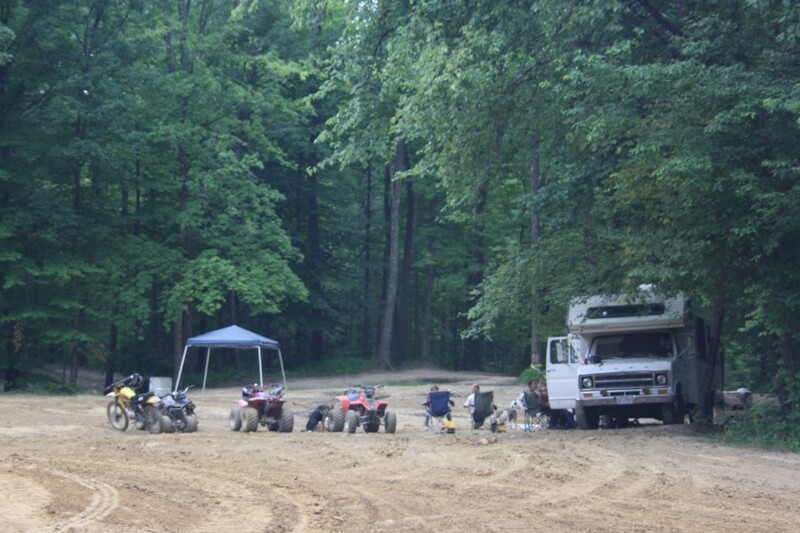 Your paid admission to the park allows you to camp anywhere on the property that you would like. Currently, all camping on Haspin Acres property is primitive camping, with no electric or water hook ups available at the present moment. Our campground area is located next to one of our two ponds and near the Admissions Building for those campers who want to be close to the restrooms and shower facilities and who prefer to camp in a designated quiet area. 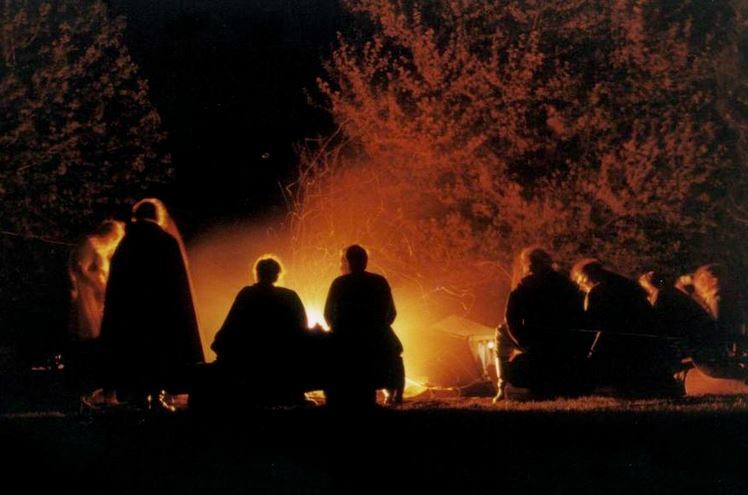 If you would prefer to camp in a more secluded area deep in the woods and without any quiet time restrictions, you are welcome to do so! We allow camping anywhere on our property. There are no porta potties available in the woods, only in the general area around the Admissions Building, campground, and MX track, so keep this in mind as you plan your visit to Haspin Acres. If you'd like to take a break from riding, feel free to relax with some nice, leisurely Fishing in one of our two ponds! You'll be surrounded by beautiful, country scenery and the soothing sounds of nature. It's the perfect way to unwind! Swimming IS permitted AT YOUR OWN RISK! A word of caution, though...please be careful if you decide to cool off in the ponds. You may swim and splash around, but absolutely NO DIVING is allowed due to the uncertainty of objects in the water. If you need firewood, just call John! If you need firewood, we have it available! Just call John at (765) 265-0090, and he can hook you right up! In some cases, he can even deliver it right to your campsite! No cell phone reception? No problem! You can also ask for firewood at the Admissions Office, and they will gladly contact John for you! DO NOT burn wooden pallets in your campfires - Help PREVENT punctured tires! Fires are to be maintained and supervised at all times. WOODEN PALLETS ARE STRICTLY FORBIDDEN FROM BEING USED AS FIREWOOD AT HASPIN ACRES! Burning wooden pallets leaves behind nails. When it rains, the nails wash away to the trails and can easily puncture tires! Don't let this happen to you or others! We can PREVENT this! Please DO NOT bring wooden pallets to our park! Haspin Acres springs back to life with beautiful, budding, green trees! During your visit to Haspin Acres, please remember that this park is primarily a natural habitat. Any help you offer to keep it that way is greatly appreciated. Receptacles are in place throughout the park for your trash. If you need firewood, check at the main gate. Please do not cut trees! During your visit to Haspin Acres, we ask that you be courteous and respectful to the park, the staff, and the other people visiting Haspin's. We appreciate your consideration of others and care of our property, and as usual, we expect all rules and regulations to be followed. They are there for a reason! We want to ensure your safety and want everyone's visit to Haspin Acres to be enjoyable. Together, we make this a fantastic place for everyone!